Preorder CZARFACE's new album "A Fistful of Peril" today! 1. There have always been tangible connections within the hip hop community and the pages of comic books. From Method Man’s alternative moniker "Johnny Blaze" and MF Doom’s persona inspired from Marvels Doctor Doom to DMC's professed love of collecting comics since a very early age. Even right here in our own back yard with the Los Wunder Twins Del Rap self-proclaimed title as the "Worlds Most Lamest Super Heroes.” Now more than ever, it feels like the success of the Czarface records, the two genres (Hip hop & Comics) have emerged to comfortably co-exist in a new unexpected way that is both fresh to hip hop heads and equally nostalgic. Is Czarface finally bringing to the surface that hip hop and comics culture have always shared a common bond? Or is Czarface here simply to save us from all the whack super-villain MC’s? Maybe a little bit of both? I think when we started working on a record together, we needed to find some common ground, and besides our affinity for classic East Coast hip-hop, our appreciation for pop culture and comic books fit perfectly. Our history with these topics in hip-hop run deep: on early Wu-Tang records Deck referenced Spider-man and Wolverine, and in '96, we released a 12" called "Secret Wars" where we name-dropped every superhero under the sun. So this material is in our blood and has been since we were kids. 2. The new vinyl release for Czarface "Every Hero Needs a Villain" comes with a full blown Jack Kirby inspired comic book of Czarface, and the CD version is packaged as a hardcover bound issue. (Hey readers, get out there & buy physical music, alright?) The issue comes complete with a clever homage to all the vintage mail-away ads from the golden age of comics. Everything from "sea monsters", dinosaur eggs, hair growing pills, Sasquatch whistles and even the "Adopt-A-Czarface" program can be ordered. Each of these adding to the Czarface story and creating something not found very often by music consumers these days. How important was it to keep the classic “golden age of comics” infusion of humor and art direction throughout the identity of this project? I think it was pretty important, but at the same time came naturally once we decided to make CZARFACE what it was. I used to write and draw comic books when I was really young and invented a guy named "Nocturnal Knight" which I thought was brilliant wordplay at the time (laughter). This guy was a reflection of all the comics and cartoons I would absorb as a youth, and kind of drove me to complete the CZARFACE comic. It was my first time writing a comic in well over 20 years but I knew that if we were going to do it, we had to do it right and throw some fake ads in there that were ever-present in the Silver Age and Bronze Age issues of Cap, Spidey, ROM, X-Men, whoever. I wanted it to reflect the era that was most influential to us. 3. Are there any plans to continue with Czarface as a monthly released comic book title or maybe even a mini-series/graphic novel? There are loose plans for comics, cartoons, video games, you name it. The plans are all in their infancy, and as you know, everything takes time and more importantly, funding. As with every art form, the ideas are easier to come up with than the execution. Right now, with the action figure, the comic, the skate deck, the vinyl, cassettes, and CDs we are juggling a lot. We will unearth more as time goes on. DMC and CZARFACE would make a great team up! People have suggested cross-promoting DMC and Czar to us, maybe one day it will make sense and we'll do an issue with a cameo. 5. 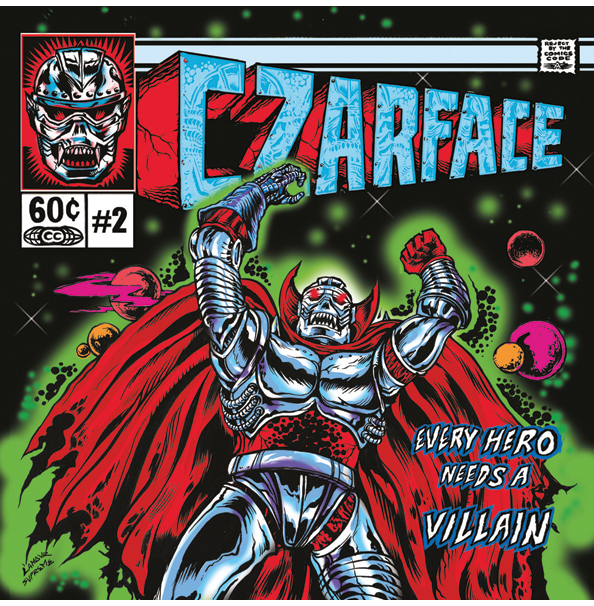 Over the years some great classic Marvel cartoon sound bites of dialogue and theme music have made their way onto 7L & Eso tracks and now Czarface. There's some really clever retro-dialogue of the villainous Dr. Yorgo and Impostarr on the latest record. How did you go about essentially creating a "new-vintage" cartoon sound, and of course....who got to be the actual voices behind those characters? Typically, that's my chamber of the production on our records, there's nothing I enjoy more than digging through vintage cartoons and finding that one amazing phrase and flipping it. 7L will come up with the beats and then I will add the sound bytes and create the skits. For CZARFACE, I wrote the dialogue and then we had a few voiceover actors help us with the execution of the characters. After they recorded the voices, I eq'd them to sound as though they came off of a Power Records 7" or off of an old 1966 Marvel cartoon. I loved this process and am doing more. 6. Serious question; How many audio folders of sound clips are there on the hard drives straight up labeled: Lasers, Spidey, FF, 60's Marvel, Star Wars sound effects, etc? How deep into the geek wormhole of saving, describing, and organizing audio samples has it gotten? In my basement, there's about 200 VHS tapes and 500 bootleg DVD's ranging from Japanese stuff to early Hanna-Barbera and Marvel cartoons and occasionally they're culled and brought into digital form to find their way onto a track somewhere. I have several hard-drives worth of these sound effects, theme songs, and dialogue from way back. Organization has never been my strong suit, so most of these are piled in varying folders that are more sensitive to what I'm working on at the time. For example, if I wanted to add a laser blast to something, I'd just search "laser" on my computer and that will find whatever I have on the external hard drives or the computer itself. Then I wind up searching "lazer" with a "z" after to see if I missed anything. To put it like Yoda, "very unorganized, my laser blasts are." They will be titled as such "FF Lazer 1" or "Gaiking Laser" but the one I had in mind I probably titled "han blast" in a rush and never found it. 7. In a perfect world scenario, do all members of Czarface feel compelled to have each track title derived from the Silver Surfer mythos? Although Silver Surfer is a huge inspiration to all of us, I think the track titles vary and aren't confined to his legacy. I wish I had a better answer here! “With two bars kill your five man group, They got a three-word vocab like ‘I am Groot’." 8. The foundation of Czarface begins with the music. That being said, we would be remiss to skip what has crossed over into pop culture including exclusive action figures from Killer Bootlegs, custom Czarface skate decks, a limited run of screen prints and even an entire gallery exhibition of "Czar-art" at Lot F doubling as a listening party. Czarface, a lot like everything in comic book culture, has crossed over into real pop-culture. Was this new realm always a part of the plan or a new unforeseen adventure? Branching out has always been part of the plan. Nothing would please me more than seeing CZARFACE on the big screen one day, or even the small screen. The different action figures were awesome, but the comic book becoming a reality was a major triumph for us. 9. With the first two Czarface records having some serious guest appearances from obviously the Wu-Tang family, are there any members from the WU lexicon and beyond that are still on the bucket list for collaborating? Any MC or producer out there that has always been someone you guys have wanted to form like Voltron on a track with? That's really weird that you asked because I've been thinking more along the lines of "how would this artist illustrate CZARFACE?" or "how would this artist sculpt CZARFACE?" than who else would rhyme with us on a track. With the last two albums and even before that, I feel like we have worked with everybody we've ever wanted to. Large Professor rapping on one of our records meant everything to me and 7L. Ghostface, Method Man, GZA, these artists are just hopping on the albums for the love and as a favor and it means the world to us. Currently, we are at a point of "where do we go from here?" 10. Lastly on a more personal note, my wife and I are expecting our first child in August, so of course names are a big topic right now. I'm campaigning pretty hard for "Norrin" if it is a boy. Any advice for an expecting father that is just trying to give his son an old fashioned name that I guess has some connection to the Silver Surfer? Congratulations, and being so well-versed in things marketed primarily to children, you will enjoy it more than ever. It is really like a second childhood for you if your kid gets into the stuff you're into. And with my right hand to Kirby, I swear Norrin was on the short-list of names for my son Xavier....but his Uncle Trevor (KARMA) told me he'd get beat up with that name so we let it go. No word on whether or not he has harnessed the "Power Cosmic" yet. A. By the Hoary Hosts of Hoggoth….. just like Dems & Republicans, Mac or PC, Everyone leans one way or another…. so, which is it; Marvel or DC? B. The Marvel Mount Rushmore: Jack Kirby, Stan Lee, Steve Ditko.....and ______________. Hmm someone named John...maybe John Buscema, John Romita Sr., or John Byrne. C. Settle a bet for us all here at Tryptic Press headquarters, please? Drake; underrated or overrated? Drake really has a flawless flow, but unfortunately, he uses it for evil. D. In the still remaining pre Bat-Fleck era; who you got & why? Adam West, Michael Keaton or Christian Bale. E. Classic “deserted island” scenario; What are the handful of albums you absolutely need with you? Hip hop or otherwise.